Evelyn & Arthur – Get 10% Off AND they will donate 10% to Second Helpings. Women love to shop, so why not shop for a worthy cause. Grab your friends and just browse. Refreshments will be served, you will learn more about Second Helpings’ mission and you might just find that outfit you’ve been looking for. It’s a girls night out for a purpose. See you there! Second Helpings is a designated charity for the Birdies for Charity fundraiser program of the Heritage Classic Foundation. With Birdies for Charity, participants can make a pledge for every birdie made during the 2019 RBC Heritage presented by Boeing April 15-21 at Harbour Town Golf Links. Make an online pledge, minimum of $25, and designate your charity as Second Helpings. You can make a flat donation and pay by credit card or check. If you choose to make a per birdie donation, the Heritage Classic Foundation will bill you after the tournament for your pledge. In 2018, the pros made 1,468 birdies. So, a pledge of 1 cent for each birdie would have resulted in a $13.00 total pledge. A $1.00 per birdie pledge would have cost $1,300. Pledges must be completed by April 21. Second Helpings will receive 100 percent of the money you pledge, plus an additional 15 percent gift from the Heritage Classic Foundation. Sign up today at http://www.heritageclassicfoundation.com/donate-now/. To learn more about Second Helpings, go to http://www.secondhelpingslc.org/help-the-hungry. This Martin Luther King Jr Holiday, the volunteers and staff at Second Helping rolled up their sleeves and met the immediate need to rescue food and make a special delivery today to some 250 federal employees who work at the prison in Estill. When the call came last Friday asking for assistance, a decision was made over the weekend not to wait until Tuesday to help these people. 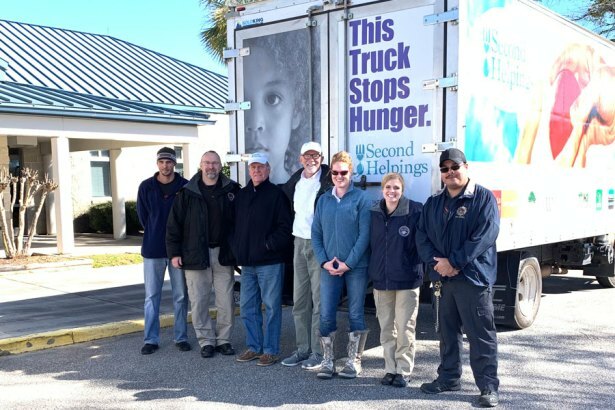 Over 3,000 pounds of meats, bread, produce, sweets and pizzas were unloaded off two Second Helpings trucks, with the help of the acting prison warden, his staff and even his chef. The load included 57 turkeys donated by the Walmart on Lady’s Island. The young couple, who live in Bluffton and both federal employees at the prison, met the two trucks in Bluffton and led the way to the facility. They are the heroes and like them, many of these federal employees need our support. Special thank you to Second Helpings staff and volunteers who raised their hands over the weekend to volunteer for this effort to help our neighbors who work for the federal government. Many of the federal employees live in our neighborhoods, especially in Bluffton and Beaufort. Donations to Second Helpings will help continue weekly deliveries until the government shutdown ends. Gift cards will also be accepted. A special thank you to the six donors who gave over the weekend. Please email execdirector@secondhelpings.org if you do make a donation. Let us know your name and date of gift through Paypal. We will make sure you receive a proper thank you.